MapIt GIS is a free app however to unlock the full potential and use it as a production tool update to MapIt Pro extension is recommended. MapBox & Offline Maps – Possibility to access your on-line MapBox maps and set them as a basemap. This feature is also required to use offline .mbtiles as a map overlay. Geoid Height for GPS – If you would like to record the orthometric height instead of the ellipsoidal GPS height which assumes the Earth to be totally homogeneous as if there be would no mountains or trenches this feature will do the job and no post processing is needed. MapIt Lines & Polygons – allows to add more then 2 line or polygon features with more than 10 vertexes. 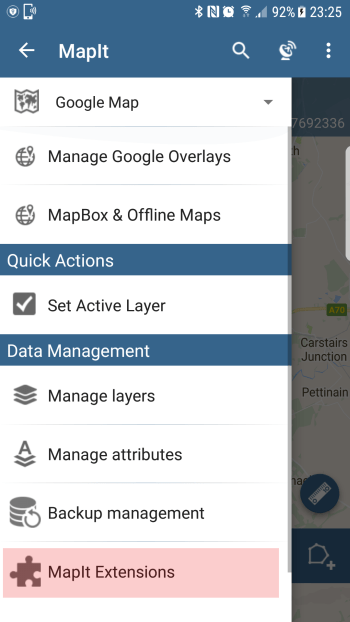 Google Maps Overlays – Access to number of predefined WMS and ArcGIS Tiled services and option to add your own services if required. Backup Management – The tool allow creation of a snapshot in time for current core database and saves it to MapIt->Backups folder on your device. To get MapIt Pro please install the app and choose “MapIt Extensions” option from the menu. Than click on the trolley button to start standard Google Play purchase flow. 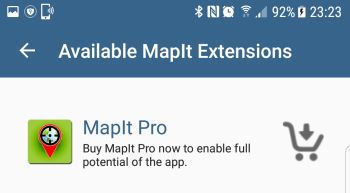 *IMPORTANT CHANGE: From version 4.8.0 (03-06-2017) only MapIt Pro Extension can be acquired. Users using existing extensions will not be affected by the change.